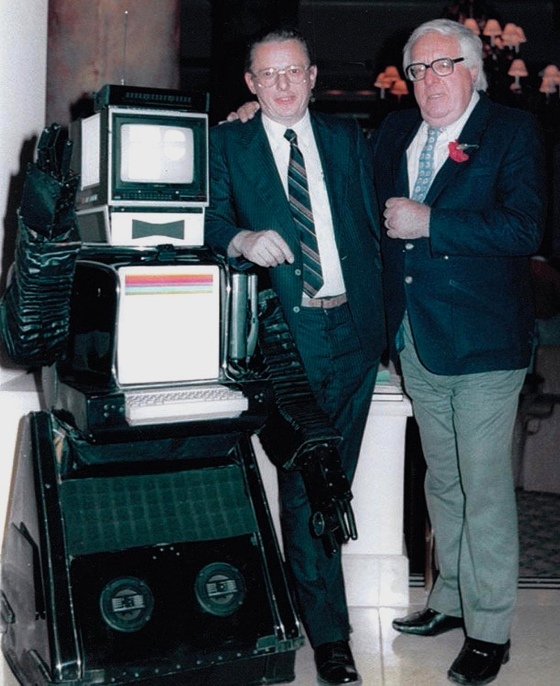 Gene Beley and Ray Bradbury pose with a show robot built by Gene in 1979. The photo was probably taken not long after the robot was built. He preached that the secret to life was finding that lifetime love in a spouse and occupation – something to jump out of bed each morning and be excited about doing. “If you haven’t found it yet, by God, keep trying until you find it!” he’d yell at college students. Today, he keeps repeating, “It’s all about love.” That love has been returned many fold from students who have since become film producers, writers and directors. Some have even hired Bradbury, or collaborated with him on projects. I feel lucky to be in that club, having met Ray in 1968 when I was a young reporter for the Ventura Star-Free Press, and I published a biography about him in 2006, Ray Bradbury Uncensored. I also saw Gene in a documentary about Johnny Cash at Folsom prison!